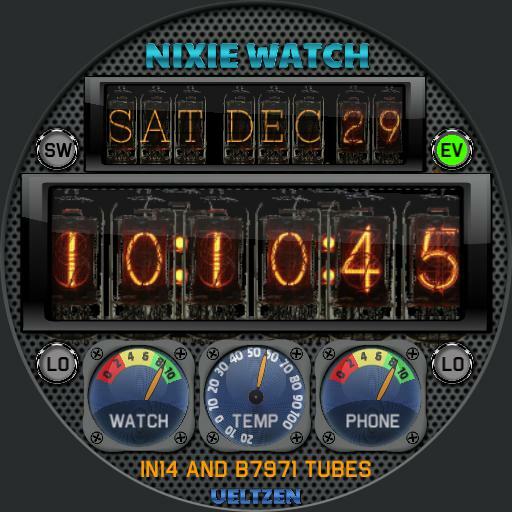 A Nixie tube watch. Tap the seconds for stopwatch, and again to return to time mode. Tap the month digits for events. Indicator light on left is yellow when stopwatch is running, and right is green when there are calendar events. Indicators by the battery meters light up red when below 30%. The digits in the upper right are stopwatch hours, when in chronograph mode. Reworked events and information page to keep with the retro 1960s equipment look. Tap the center of the screen to return to time mode. Thanks to Peter Hull for the VT323 computer terminal font.